The unemployment rate dropped to 3.7 percent in September, a low not seen since 1969. The rate dropped from 3.9 percent in August, according to the latest Labor Department report. September marked the third straight month of unemployment below 4 percent. Why? The short answer: The economy is good. The second answer: Not as many people are in the labor force, so they aren’t counted in the unemployment rate. The economy added 134,000 jobs last month, well below what economists predicted, largely because of a decline in the leisure sector, which was hit hard by Hurricane Florence. The low number of new jobs last month was also partially offset by upward revisions to July and August job gains, which reflect an additional 87,000 jobs. The department said 165,000 jobs were created in July, up from the previous estimate of 147,000. A total of 270,000 jobs were gained in August, up from 201,000. Here’s what else you should know about the latest jobs report. The last time the general unemployment rate was this low, millions of men had been drafted for the Vietnam War, and, therefore, taken out of the labor force. Unemployment dropped near these levels more recently at the end of the 1990s tech boom. But even then, unemployment only fell to 3.8 percent in April 2000. Economists say there is no indication the labor market is expected to weaken anytime soon. “The economy is really strong right now,” said Dan North, chief economist at Euler Hermes North America. If the economy continues to perform, that bodes well for a Federal Reserve interest rate hike for December and two to three more hikes next year, North said. The labor force participation rate is still low compared to historic averages. That means there are still a lot of people sitting on the sidelines. Geography, the skills gap, the opioid epidemic, more people going to college and a lack of family leave policies aimed at encouraging women to enter the labor force could all be contributing to the low rate. 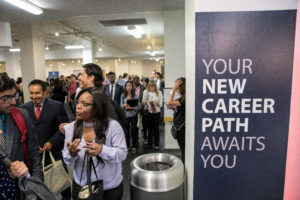 One positive note: “It seems it’s easier to find a job once you’ve decided that that is an option that is on the table,” Zip Recruiter chief economist Cathy Barrera said. Barrera said she has also seen data that show more people are going straight from not being in the labor force to being employed, bypassing the “unemployed” status altogether. Wages outpaced inflation in September, although both the rate of wage growth and inflation have tapered off slightly in the last month. Wages have grown 2.8 percent over the last year, down from last month’s estimate of 2.9 percent. That is still above the inflation rate, which has fallen to 2.7 percent, according to Bureau of Statistics data released last month. The increase of part-time rather than full-time workers could be keeping the wages down. Another number that provides some insight is weekly wages. They are growing at a rate of 3.4 percent compared to an historic average closer to 2.5 percent. North said the numbers indicate that employers are requiring the people they already have on their payrolls to work longer hours each week. That’s because companies are struggling to find skilled workers who can pass the drug test or don’t have a criminal record. As a result, some employers are not asking potential hires about their drug use and looking past their criminal history.